you absolutely can't go wrong with a double humbucker bongo. Why not get a 6? fair enough. the bongo has such an unbelievably versatile tone. 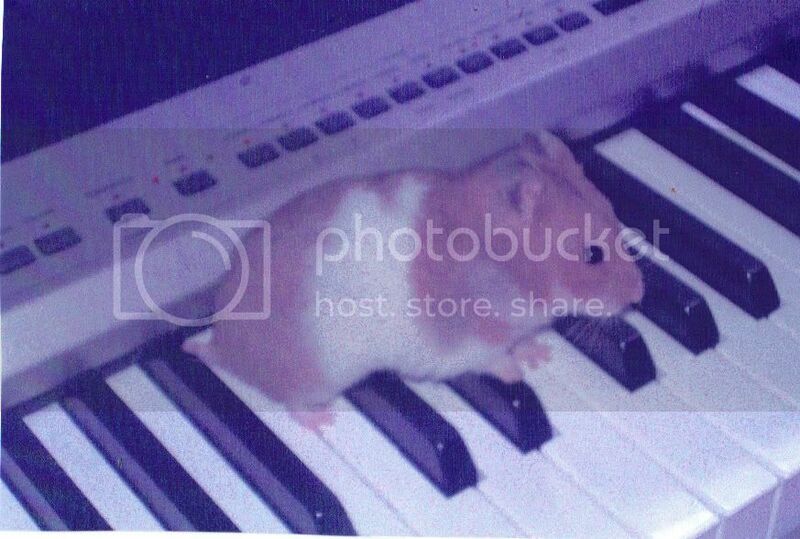 My Piano is a Korg SP-300 and sitting on it is my hamster Harmony who used to run all over my keys as i was playing Good times, Good times! How I envy that hamster. You "envy" my hamster?? why? I don't get it? He's sitting on a good keyboard? As far as I know. While it may not be the best out there, I've got a good amount of gear. 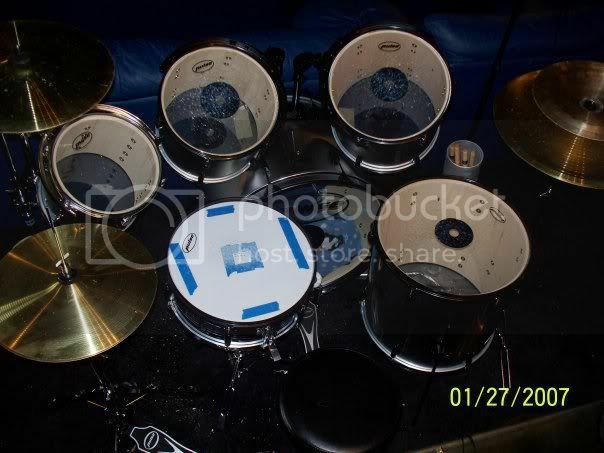 My baby is my Pulse drum set. As of right now it's a 6 piece (10", 12", 13", 16" toms, 14x6.5 snare, 22" bass). 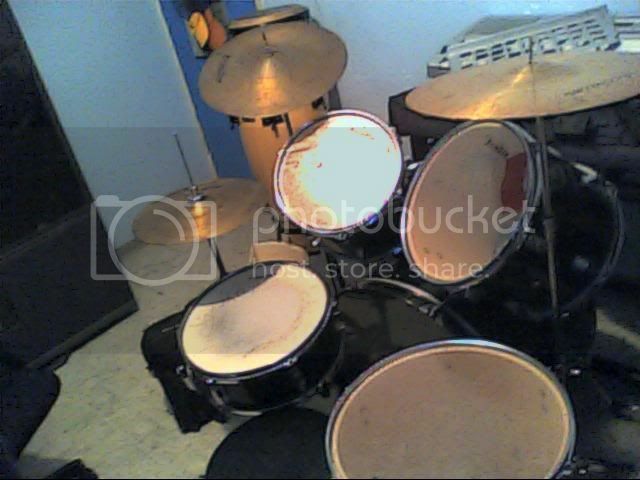 My cymbal setup is going to change soon; right now I've got an 18" crash/ride and 14" crash that came with the drums. They're not amazing but I like the sound. A friend gave me a set of Zildjian A hats and a Han Chi 12" china-splash. I don't like the sound of both Zildjian hats, but I use the bottom Zildjian and top no-name. I plan to use the extra hats as crashes, and right now I have the china stacked over the ride. 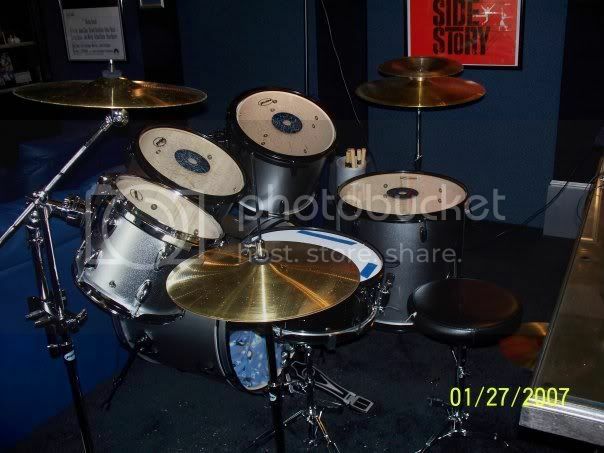 Also, when I got the drums my parents let me move them into our theater since there's sound-proofing and whatnot in there. 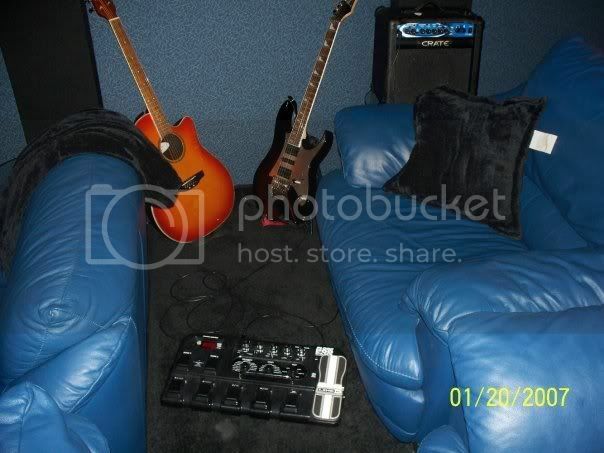 My band is going to use this room as our studio, which is actually kinda neat because there's room for everyone, plenty of seating and places for us to sleep if we're recording over the weekend, a full bathroom, microwave and fridge. Panoramic of the whole room. Our singer just goes where ever. 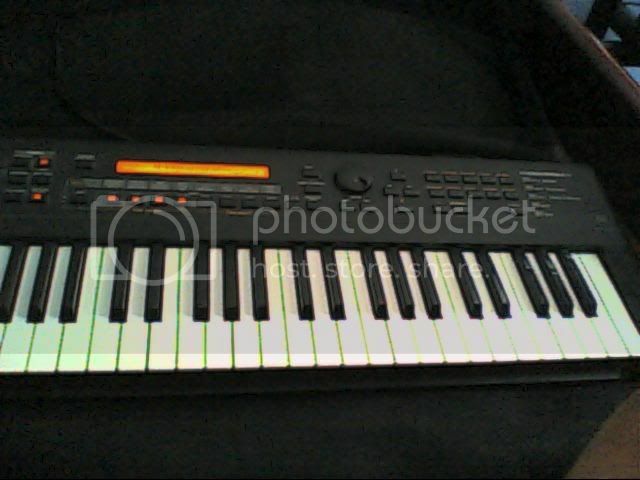 We record one instrument at a time. For guitar, bass, vocals, and any keys we may have, we run it through the Pod and use a 1/4-to-USB cable and record in Audacity. For drums, I use a USB Rock Band microphone. It seems ridiculous but the sound isn't too bad. Until I get a mic kit and mixer, it'll do. I just got a MacBook Pro, so we do all mixing in GarageBand. This is my good ol´ Sunlite kit. 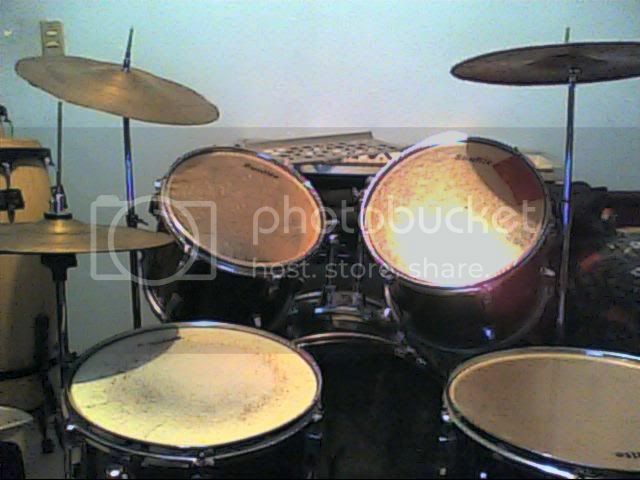 Since I only use it for practice, I haven´t bought new heads. The cymbals are even the ones that come included in the kit . Since I currently just play with the school band and they have a drumset in school, I don´t need a high-end, quality kit, but this one doesn´t sounds bad. BTW, nice gear everyone . 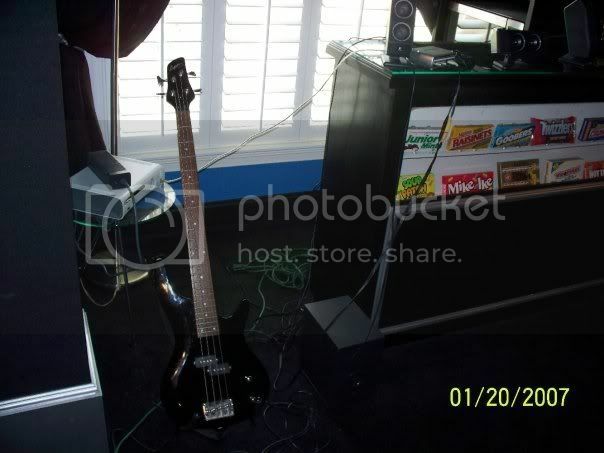 Me and my 5 string bass. That's because Shreddies are freakin' awesome and you can't deny that. Everyone here is in denial. Watch out for the crocodiles! 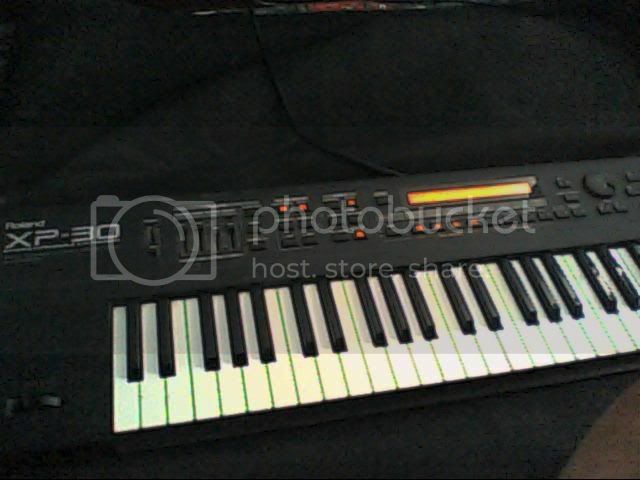 Nothing special right now, just a Yamaha Clavinova Digital Piano and a 61-key keyboard without touch I hook up to my computer via MIDI and do experiments with via softsynths.. I'll buy something when I'll get some money. chrisbDTM has an acoustic Epiphone really similar to mine. 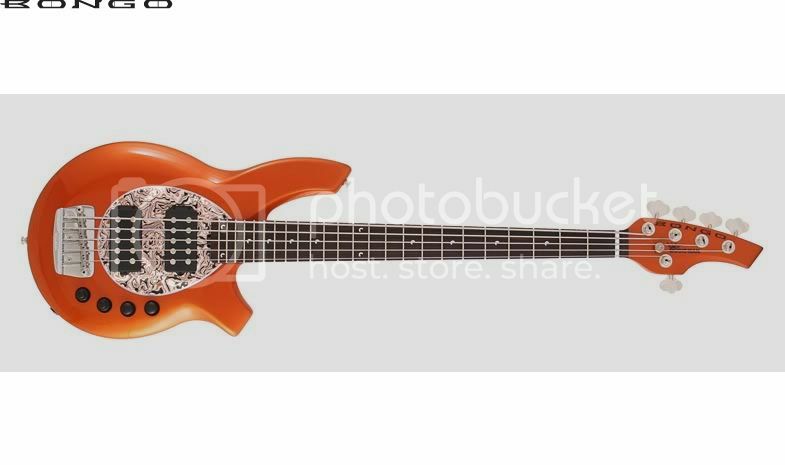 What's with the two jacks on the ibanez? Is it a piezo output? 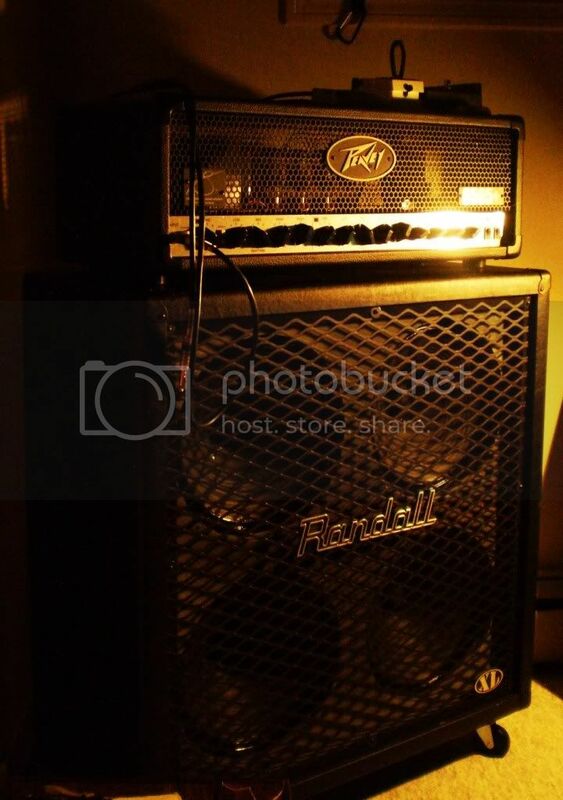 My Gibson SG. The only style guitar I really play, since I play right-handed guitars upside down and its fairly symmetrical.